The Recession may be officially over, but the restaurant industry—especially smaller independent restaurants are still feeling lasting effects. Unemployment may be low, but as long as wages for most Americans remain stagnant, dining out for many will still be a luxury, not a necessity. And when consumers do go out to eat, they now expect the most value for their dollars, value in money, taste, health, and convenience. Back in 2009, we wrote a list of tips for recession-proofing your restaurant. We find that these tips are still good advice today. If you are looking for ways to save money/ increase profits at your restaurant, there are many inexpensive options available. Take a closer look at your restaurant menu. Are there certain menu items that aren’t moving? Is your food cost correct? It may be time to trim down your menu and remove pricier items, like shellfish or prime cuts of beef and offer less expensive items that will appeal to customers on a budget. Remember, a bigger menu isn't always better. Advertising can quickly eat up extra cash from any restaurant budget. However, a recession is not the time to cut out advertising. While you don’t need to do a full-scale media assault, with radio ads, TV commercials, and a print campaign, you should budget out enough for newspaper ads and keep your website updated. Needless to say, if you aren't using social media to promote your restaurant, you should be. Look for ways to trim your payroll. If Mondays nights are typically slow, do you need as many servers? Or a host? If you employ a general manager, they can fill in for a bartender or host, since they are on salary anyway. However, be wary of cutting back too much staff at the risk of sacrificing customer service. 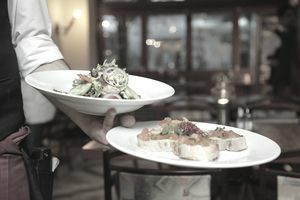 If you have a new restaurant, don't make any sweeping changes to your staffing schedule until you see patterns arise after a few months of business. Only run a skeleton crew on Monday nights if Monday nights are consistently slow. One, two, even three weeks in a row doesn't mean that business won't pick up. Especially if you incorporate some restaurant promotions (up next). Two-for-one specials, coupons, early bird dinners are all great ways to lure in customers during a recession. Offer them the most bang for their buck. Restaurant promotions can range for a nightly happy hour to an annual customer appreciation day, with drink and dinner specials. Take your promotions online, utilizing social media. Check out how these restaurants used Instagram to increase sales through online promotions. Your mom had the best advice when it comes to saving money. Don’t waste electricity, water or food. There are many small ways that restaurants can save money, from installing low-flow faucets to purchasing energy efficient appliances. Not only are some of these steps good for your budget, but they are also environmentally friendly as well. All of the above tips are things you should be doing, regardless if there is a recession or not. Restaurants need constant monitoring. Taking the time to make sure your restaurant expenses are under control will help circumvent problems in the future.